The following article first appeared in Leadership Journal. How a young pastor braced his people in the fear-filled days before London’s Blitz. Before the bombs, however, came an agonizing year of waiting. Throughout the fall and winter of 1939, and then the spring of 1940, Britons were shadowed by an acute sense of vulnerability. They could see the awesome power of the German war machine. They knew that it did not spare cities full of civilians. At a large church in central London, in the shadow of Buckingham Palace, a young, newly-installed minister faced the greatest preaching challenge of his life. In the silence before the bombs fell, he must prepare his congregation for war. His opportunity for ministry lay not in the aftermath of crisis, but in the moments prior to it. He had to address a fearful people’s most troubling question: Why does God allow war? Martyn Lloyd-Jones is today a heroic figure, a clear-minded, warm-hearted preacher. Reformed theologian J. I. Packer calls him “the greatest man I ever knew-not just brilliant, but wise.” During his 30-year tenure at London’s well-known Westminster Chapel, Lloyd-Jones’s ministry elicited a steady stream of conversions as well as long lines seeking and receiving his counsel. But at that moment, in the fall of 1939, Lloyd-Jones had yet to establish his reputation. He was merely the associate of the great G. Campbell Morgan, recently called up from his only pastorate in an insignificant Welsh village. Lloyd-Jones, however, had been well-prepared for this moment. Growing up in Wales, he experienced his share of suffering, including the loss of his house (and nearly his life) to fire, the bankruptcy of his father, and the untimely deaths of his older brother and father. During his school years at Tregaron, a town four miles from his own, he suffered unbearably from both homesickness and “chilblains,” which brought on severe itching and burning on his hands and feet. These kept him in more or less constant pain, preventing him from playing or running. After his conversion in his early 20s, Lloyd-Jones sacrificed a promising career in medicine for a call to ministry. Nearing retirement, the 72-year-old Morgan was revered as a great Bible teacher. His Friday night Bible classes and Sunday sermons drew thousands each week. But the older man’s Arminianism contrasted sharply with his younger colleague’s Calvinism. The difference did not bother Morgan, however, who deeply respected Lloyd-Jones and gladly shared with him oversight of his large congregation. Under the circumstances—the fearful prospect of wartime destruction and under the coolly assessing gaze of prominent members of a new congregation—many preachers would have yielded to the temptation of a soft message offering vague comfort. It just wasn’t in his make-up, or his theology. He knew his people would need not easy reassurance but an anchor for the ordeal ahead—a foundation of trust in God that would allow them to accept his will and trust him to see them through. The question Lloyd-Jones faced, as he mounted his pulpit before a group of people expecting imminent air raids, is as old as Job: Why, if God is loving and powerful, do we experience so much suffering in this world? 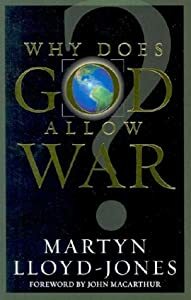 He launched a five-sermon series on this theme—later published as the small book Why Does God Allow War?—by addressing from 1 Timothy 2:8 the problem of unanswered prayer. To those who had not seen response to their “crisis prayers,” Lloyd-Jones answered sternly: Prayer practiced as a “mechanism designed to produce certain results,”divorced from worship and obedience, was already doomed to fail. One must throw off both sinful attitudes and unfaithful doubting if one is to pray as Scripture dictates. Before we conclude, said Lloyd-Jones, that times of crisis show God is not being fair to us or consistent with his promises, we must reason from the revealed character of God and our experience of his love. God is never unjust and never contradicts himself. He has given us, as he did Manoah, “striking tokens of his presence and his goodness.” Will he now destroy us? Lloyd-Jones concluded with the words of Paul: “He that spared not his own son but delivered him up for us all, how shall he not with him also freely give us all things?” (Rom. 8:32). In the end, however—and this is his fifth sermon—God works in war as in all things for our good (Rom. 8:28). As with the prodigal son, it is only in suffering that we see our “folly and stupidity” and we think of God and seek to return to him. This is the ultimate answer to the question, Why does God allow war? Lloyd-Jones’s approach was masterful. Instead of presuming to plumb the mind of God and explain his purposes, he turned his audience toward meditation on their own hearts. He did not trouble himself with philosophical solutions to the problem of evil. He immediately set out cutting, with the scalpel of the Word, where the problem really lay. The great Welshman’s wisdom was proved by its fruits, though it did not seem so in the short term. Bombs rained down on London, for 57 straight nights at one stretch. The people fled to the subways and shelters, and all who could left the beleaguered city. Of Westminster Chapel’s more than 2,000 members, only a few hundred stayed and braved London’s years in the German crosshairs. In one service during the summer of 1944, a flying bomb exploded only yards from the church, showering the congregation with fine white powder. One woman thought, when she opened her eyes after the deafening concussion, that the whole congregation was now in heaven! Lloyd-Jones’s reputation for wisdom and (not insignificantly) courage in steering his people through the dark days of the Blitz spread after the war. By 1948, the congregation had returned to some 1,400 regular attenders, and at services during the 1951 National Centenary Exposition, the church was filled to its capacity of 2,500. Each knew that in peace as in times of crisis, there is no greater blessing than a wise exegete who knows both the Bible and human hearts, and makes one speak clearly and forcefully to the other. Copyright © 2004 by the author or Christianity Today International/Leadership Journal.Click here for reprint information onLeadership Journal. This entry was posted in Uncategorized and tagged London Blitz, preaching Martyn Lloyd-Jones, problem of evil, theodicy, Veterans Day, war. Bookmark the permalink.